LOVE BEING A NONNY! 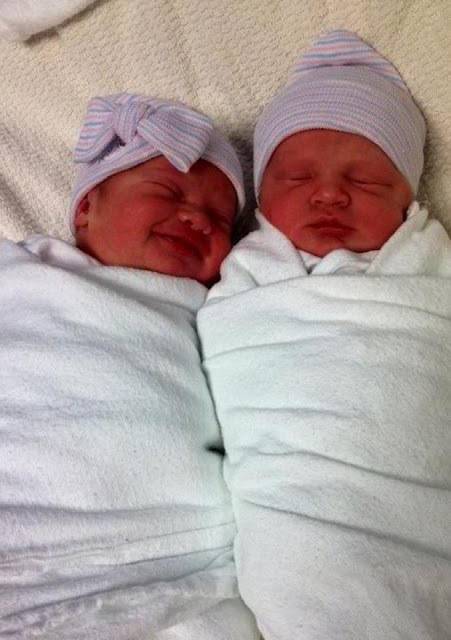 : The TWINS Are Here! A beautiful baby girl weighing 7 lbs. 6 oz. A darling baby boy weighing 7 lbs. 8 oz. Oh my word. They are so beautiful!!!! And how perfect to get a girl and a boy.God is so good. Congratulations to your family. Enjoy this very special time. Congratulations!! They are just precious!! You are in for some very fun times with all of your sweet grandbabies together in the future. They are adorable!! Look at that sweet little girl smiling already. You are truly blessed. Congratulations!! Congratulations to all of you, they are absolutely beautiful. What an amazing Blessing. Beautiful and handsome.......and big!!!!! That is great!!!!! Congratulations on the beautiful babies. Yes, you are blessed. I recently found your blog and have been enjoying reading it. Beautiful babies! How great is our God? This is the sweetest picture. They already look so happy. Sending blessings and love to these two, Nonny and Poppy, and the whole family! Congratulations!!! I know you are going to have the best time showering these sweet babies with love. Wow! I saw those gorgeous babies on your facebook page, but didn't realize how big they were! Amazing! You are truly blessed. I'm so happy for you. Rejoicing with you! They are adorable and so BIG! Congratulations! Wow 38 weeks and healthy babies, so blessed!!! Can't wait to see more pictures:) Those babies are so lucky to have a Nonny like you!!! Easter and a Special Birthday!